A fleet of 22 International Moths turned out for the second Noble Marine Grand Prix event of the year at Parkstone Sailing Club, Poole over the weekend of 23rd & 24th March. After a winter of storms and difficult conditions it was good to see a forecast of sailable conditions for the whole weekend, the GP at QMSC had to be abandoned just 2 weeks earlier due to strong winds. 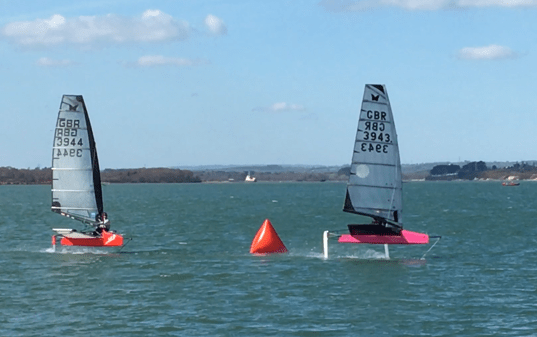 A northerly breeze of force 2 meant that it was just sufficient to foil so the fleet were eager to get under way for effectively the first event of the year. First race Saw Ben Clegg showing good form throughout with a comfortable lead followed by Dan Ellis and Jason Belben. Ben then went for a port tack start on the second race to take him over to the left of the course by Brownsee Island while the rest of the fleet went right. The wind cut out on the right and the majority of the fleet fell to low riding mode while Ben foiled in on the layline. His lead of almost a leg looked confirmed but the conditions and nature of Moth sailing meant this was not the case as he too came off the foils on the last run to allow Simon Hiscocks to foil from behind and take the race. So was the final race of the day of large ‘Snakes and Ladders’ as the wind became even more fickle. Jason took the race followed by Simon and Jim McMillian, who had put in consistent top three results throughout the day. The fleet came ashore as the breeze and water disappeared assembling for a curry and overnight stop at Rod’s house. Sunday started with a perfect spring day and a light Northwest wind, more than had been forecast. Jim showed his light weather talents to take the first race followed by Alex Adams. It was clear this was going to be a testing day with bands of pressure coming down the race course from either the left or the right side resulting in half the fleet staying on the foils whist the other came off. Jim and Dan Ellis showed good consistence throughout the day and without Simon able to sail the Sunday, confirmed podium positions. The wind picked up for the final race which became a duel between Jim and Jason, the latter winning but Jim’s consistently wining the weekend. The next event in the Noble Marine GP series is at Grafham Water Sailing club on 13/14th April. Previous 2018 UK National Champion – Jim McMillan!